As we pulled in the driveway tonight I spotted something down the road. Something I have been wanting to find for a couple years now. Something that was the cutest thing I'd seen in a long time. Thank goodness kiddo was with us - she grabbed my camera and walked down the road just a bit for this special picture. 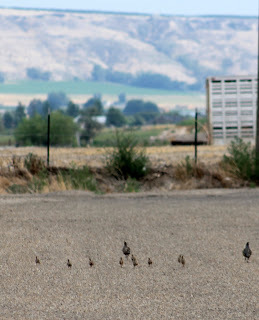 Those baby quail are so teeny tiny!